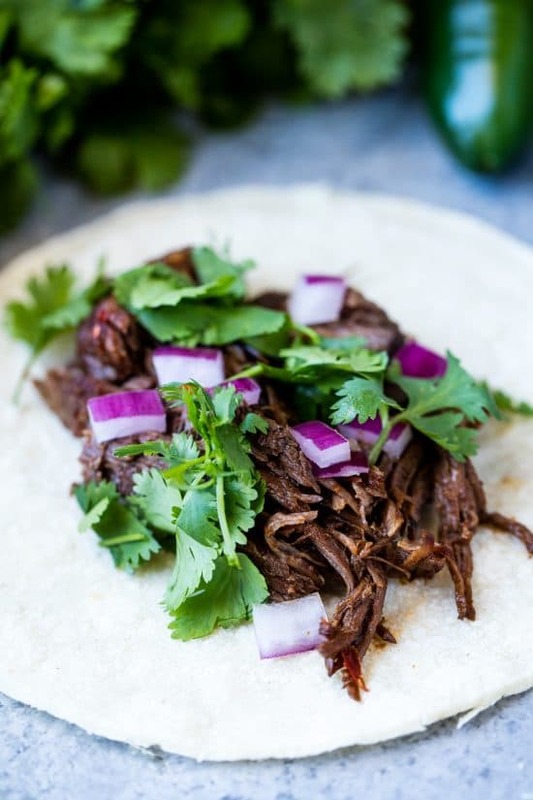 This easy recipe for Mexican Beef Barbacoa is full of authentic flavor and can be easily made in the oven, slow cooker, or an Instant Pot! 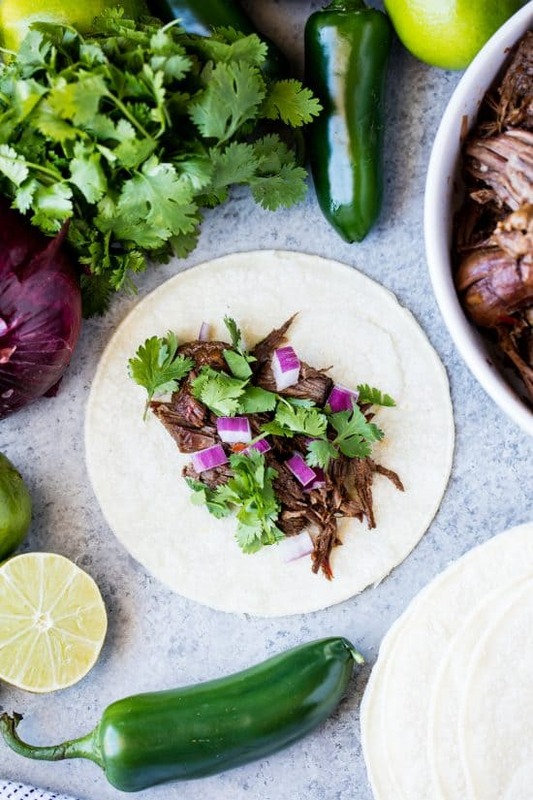 I’ve given this recipe as much authentic flavor as possible to bring you a full flavored Beef Barbacoa that rivals anything you’ll get in a restaurant. Your family will quickly fall in love with this easy recipe. Serve it up on tacos, or as a main dish with sides of rice and beans. The sauce for this recipe uses dried guajillo and ancho peppers. These peppers are easily found in most supermarkets in the hispanic section. They can be intimidating to work with if you’ve never done it before, but they are actually super easy! For this recipe, you’ll need to rehydrate your peppers. Simply place them into a bowl or jar and cover them with water. Let them soak for 1 to 4 hours (or overnight) before using in the recipe. If you need to speed up the process of soaking your peppers, pour boiling water over them and let them sit for at least 30 minutes. The heat will help soften them faster. You can make the sauce for this recipe in either a blender or a food processor. Water is needed to thin out the sauce enough to blend smoothly. Start with 1/4 cup of water and add more if you find it necessary to get it to blend (which depends on your blender). PRO TIP: You can use the water you soaked your peppers in for extra flavor. 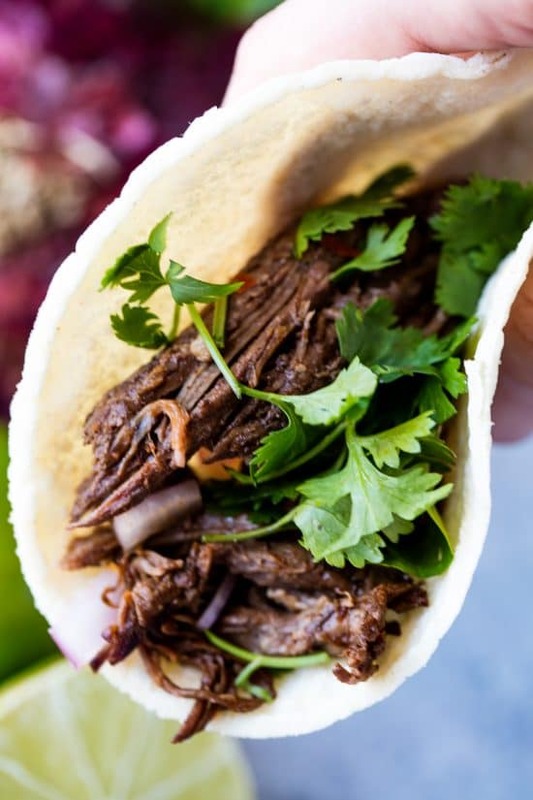 Barbacoa was originally made using lamb, goat, or the head of a cow (beef cheeks). This same recipe will work with ANY of those items and the meat can easily be switched out without changing cooking times. I’ve used beef chuck roast in the photos and written recipe because it is most readily available to the majority of my audience. This recipe includes instructions for a traditional braise in the oven, as well as instructions for the slow cooker and the Instant Pot. If you aren’t familiar with the Instant Pot yet, it’s a trendy kitchen gadget that is an electric pressure cooker. It can cook your roast to tender in just over 1 hour. Pretty impressive! Watch the video below where I show you how to make this recipe in an Instant Pot, including some basic demonstration of how the pressure release valve works which can be helpful for first time Instant Pot users. 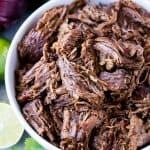 This easy recipe for Mexican Beef Barbacoa is full of authentic flavor and can be easily made in the oven, slow cooker, or Instant Pot! Place dried peppers into a bowl or jar and fill with water until covered. Soak 1 to 4 hours until softened. Season chuck roast with salt and pepper. Heat a large cast iron pot over high heat. Add in 2 tablespoons olive oil. Sear chuck roast on all sides. Once seared, remove pot from heat and set aside. In a blender, add in guajillo peppers, ancho peppers, chipotle, garlic, cider vinegar, brown sugar, salt, oregano, cinnamon, remaining 2 tablespoons olive oil, and water. Blend until smooth, adding more water if necessary to thin it out enough to blend. Pour sauce over chuck roast in the pan. Place the lid on and braise in a 300 degree oven for 3 hours, until meat is tender and easily shreds with a fork. Shred and serve. Serving Suggestion: serve on a warmed corn tortilla with some red onion, cilantro, and jalapeno. 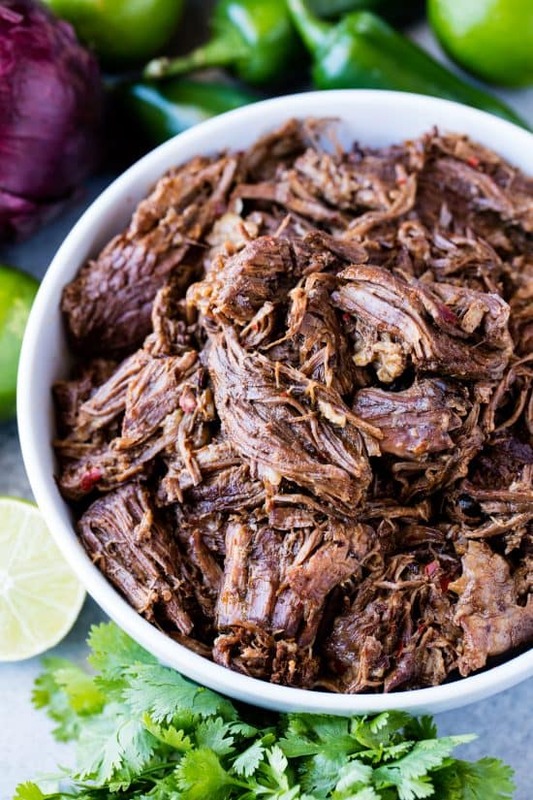 SLOW COOKER: Place seasoned chuck roast in a slow cooker. Make sauce according to directions and pour over meat. Cook on high 6 hours, or low 8 to 10 hours. INSTANT POT: Use the sear setting to sear seasoned roast. Make sauce and pour over meat. Cook on the beef/stew setting for about 70 minutes. Just one. Chipotles in adobo are super powerful. There are very few recipes out there that would call for an entire can. I’d need a fire hose for my mouth!